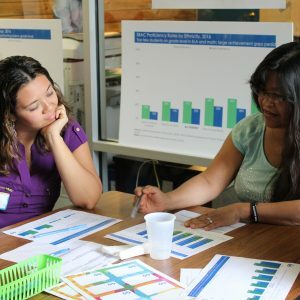 Parents engage in a powerful conversation about the urgent need to transform our schools. 20 families came together yesterday morning to learn more about how Fresno Unified schools are doing when it comes to preparing students for life beyond high school and they helped us inform the next steps in our journey to boldly transform public schools in our community. 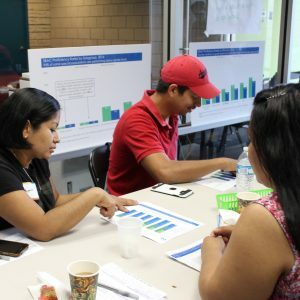 Our partners at Every Neighborhood Partnerships invited several of their parent leaders to join GO in a two hour workshop (held entirely in Spanish!) to dive deep into student outcome data, share the different ways their own children learn and grow, and learn more about our upcoming Family Leadership Fellowship. Parents grappled with the real data and related that to their children’s own experiences in schools. They were excited to talk about where their students found success in learning, and eager to identify solutions where their students and others like them are NOT finding success. We were grateful to have the wisdom of so many parents in the room and were energized by their commitment to bold systems change. We cannot wait to connect with more and more parents in these critical conversations through future Choosing Our Future 2.0 events! If you are a parent interesting in learning more about our Family Leadership Fellowship (starting in September 2017), please fill out the Contact Us form to let us know!